Experience the incredible story of how mankind discovered man’s best friend. This film was set to release in September last year but was postponed twice. It is set in Europe 20,000 years ago, when the climate was very cold. While on his first hunt, an initiation to his tribe’s most elite group, a young man is injured and left for dead after a bison hunt goes wrong. He awakes to find himself broken, alone, and miles from his village. He must learn to survive and navigate the harsh and unforgiving wilderness. 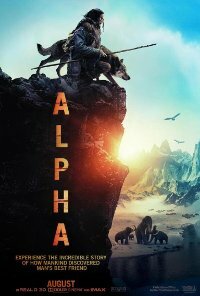 He manages to tame a lone wolf, Alpha, abandoned by its pack, and the pair learn to rely on each other to hunt and become unlikely allies, enduring countless dangers and overwhelming odds in order to find their way home before the deadly winter arrives. This film is releasing in 2D and 3D. This is the 2D version. Action, Adventure, Animals, Drama, Thriller. Violence Moderate impact. Fairly Frequent. Action based. Also physical and psychological. Threat by animals and elements. Justified. 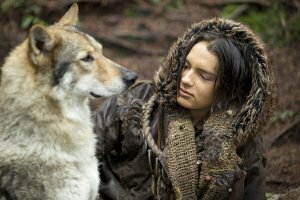 Comments This action, drama with a tone of adventure is set within an historical time, and has complex and mature themes that realistically interrogate the rights of passage from boy to manhood, the bond formed between a father and his son, and the new bond between a boy and his friend the wolf. Themes include thrilling elements which explore survival against wild animals, the elements, working as a team, and protecting each other in an environment where the culture and rituals of the hunter gatherer are explored. Themes of initiation which include the young men fighting each other (implied) and hunting and actually having to kill the animal by delivering the knife blow are of a more mature nature and as the film has subtitles from beginning to end due to the language spoken being of an unknown nature, these may be indicative of a more mature target market than the 10 -12 year old. Although some scenes of bonding between man and wolf may be entertaining for younger viewers, the cumulative impact of the violence and the constant sense of threat to life, diminishes the entertainment value and adds to a sense of realism which increases the impact. Although the film may have educational merit in terms of being set within an historical context, but this is a fictionalised interpretation of lifestyle and rituals of the clan in this period of time. Children below the age of 13 will be psychologically harmed by the constant sense of threat and menace sustained throughout the film against the life of the protagonist. There are positive themes of overcoming challenges, learning from life lessons and the development of close bonds between man and beast.